Leeks. They're a local vegetable. We see fields of them growing on the land between the Cher and the Loire rivers. Most local gardeners have a couple of rows of leeks in their plots. I grew some in the first year or two of our vegetable garden and I'm thinking about growing some again this year. The only issue with that is that you have to eat a lot of leeks. They're related to onions, but are much milder than an onion and a little sweeter. A plate of trimmed and steamed leeks, cooling, ready to be dressed. 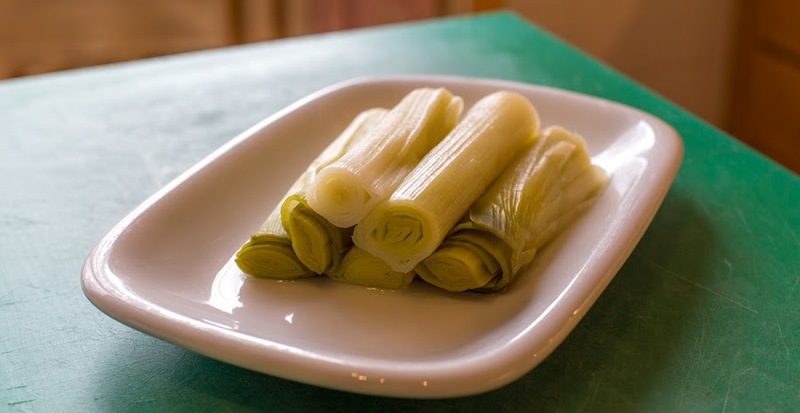 The leeks pictured here have been trimmed and steamed. Fresh leeks can be up to two feet long, with half of the length being the white root-ends and the other half the green leaf-ends. When we have leeks, we cut the greens off and freeze them. They get used as an aromatic in stews and soups or in a pot of beans. The white ends are best for eating. In this case, they're steamed until tender, then chilled and served with vinaigrette as a salad. Sometimes I'll slice and sauté the white ends and bake them on a pizza with smokey lardons (bacon). I prefer leeks to onions and, believe it or not, I'm grateful for the cooking lesson. I didn't know what part I was eating or how big they actually grew. Luv 'em. I've always boiled them before, and it wasn't until recently that I heard that. as in the case of broccoli, boiling is the worst that can be done as it removes all the flavour and 'goodness', rendering them tastelessly bland, and that steaming the broccoli was the way to go. I imagine that leeks should be given the same treatment so in future it'll be steamed leeks too. Thanks for the hint. Do you ever make Tarte aux poireaux ? My au pair family used to make it now and then. By the way, do you or Ken know what technically makes the difference between a quiche and a tarte (made with egg batter)? mitch, it's always good to know what one is eating. raybeard, the steamer at our house gets a good workout. « Ce qui répond à l'appellation quiche est souvent salé. Ce qui va varier, ce sera essentiellement les ingrédients qu'on mettra dedans mais l'appareil, qui fait le gros de la recette (contrairement à la tourte où c'est la garniture qui l'emporte), est à base d'œufs et la pâte peut être soit feuilletée soit brisée ». « La tarte peut aussi être salée mais est essentiellement sucrée. Les pâtes qui rentrent dans sa composition sont donc des pâtes sucrées : brisée, sablée ou feuilletée. Ensuite, la garniture est essentiellement composée de fruits frais ou en boîte, comme c'est souvent le cas pour les tartes aux poires. Il peut y avoir de la crème pâtissière ou d'amandes à l'intérieur mais pas forcément ». Source sur Plurielles.fr : Quiche, tarte ou tourte : quelle est la différence ? michael, I've said it before and I'll say it again!